Every player is unique. AMC is based at all time on individual approach only. The improvement of mental game sessions take usually 1-4 hours. For example – session on the driving range takes approx. 2 hours; 18 holes guidance takes approx. 4 hours. 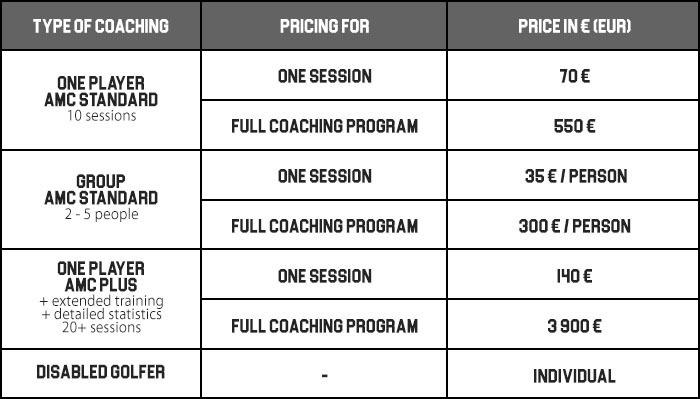 We recommend the full coaching program for all – amateur and also PRO golfers. Individual coaching sessions serve for curing the problematic issues of the mental game. The length of session depends on player’s actual playing level. First coaching session in full program starts with collecting personal data.We keep all collected data from player as private and all our procedures comply with GDPR issued by European Parliament. Session can be picked from Full coaching program separately..
All players can choose from unlimited guidance on the golf course during the practicing or during the competition.